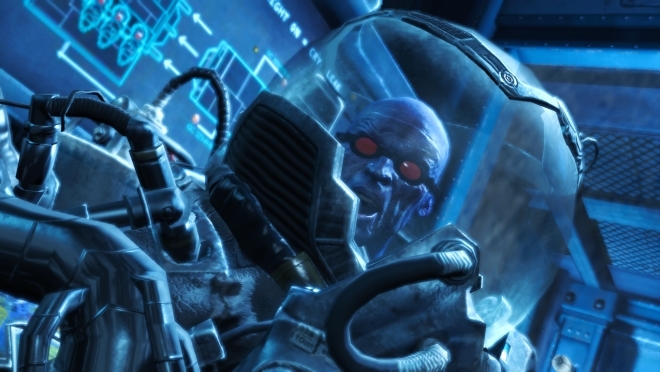 ‘Cold, Cold Heart’ is an expansion for Batman: Arkham Origins that introduces the wintry villain Mr. Freeze. Tragically, at no point in this add-on does Mr. Freeze say “Stay cool” or “Let’s kick some ice!” or even “Revenge is a dish best served cold.” It’s as if he doesn’t realise the entire point of being a cold-themed bad guy is the incredible variety of puns available to him. If you played the ‘Harley Quinn’s Revenge’ expansion for Arkham City you’ll have an idea what to expect: a string of missions set several days after the main game, giving you access to basically the complete set of unlockable Bat-toys from the start, minus the experience points and levelling-up. 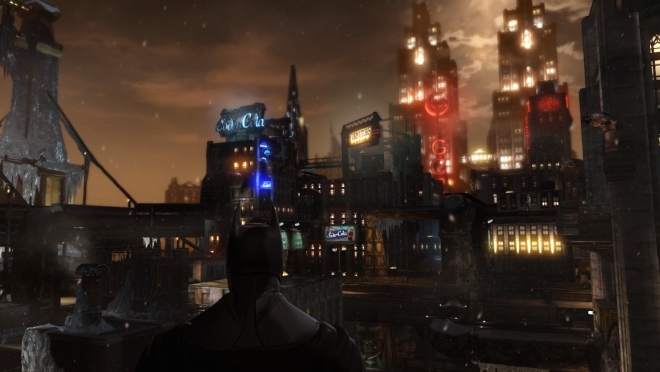 Unlike ‘Harley Quinn’s Revenge’, ‘Cold, Cold Heart’ does eventually give you free-roaming access to two districts of the city, so you can still enjoy plenty of the rooftop-roaming that is half the fun of Batman games and is still enjoyable here. A side-story has riots triggered by C-list villain Anarky taking place on the same night, so you’ve got a reason to wander off-plot and explore between figuring out what Freeze and Penguin are up to. It does feel a bit weird beating up Anarky’s activists, especially when his basic complaint – Gotham’s incurably corrupt, a revolution would be more likely to fix it than any amount of punching people dressed as animals – seems sort of legit. 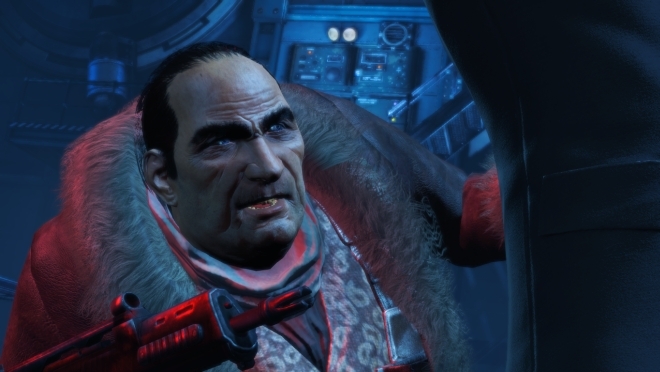 The Penguin is pretty punchable, though: he has the same annoying cockney accent he has in other Arkham games and keeps using the word “numpty” as an adjective. You’ll be tracking him and his gang through the usual punch-ups and predator areas, perching on things while silently defeating well-armed thugs one at a time. The difficulty’s been ramped up by adding more armoured snipers as well as guys with freeze cannons; a couple of these rooms are annoyingly tough. I miss having the option to swoop away and level up or earn new equipment. 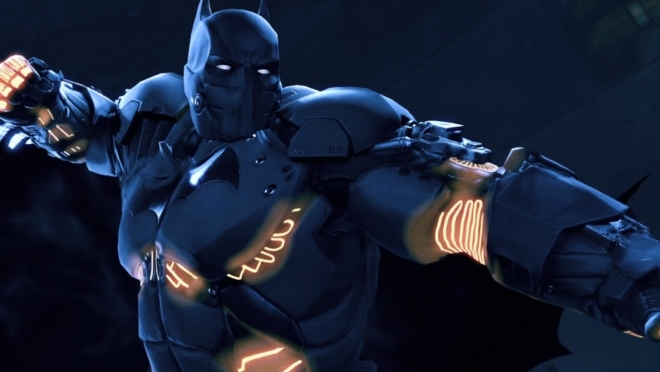 Partway through ‘Cold, Cold Heart’ you do unlock a new Batsuit, one that protects you from a degree of cold and gives you thermal gloves that turn your fists into sandwich toasters – sandwich toasters of justice. The glue gun you developed in Arkham Origins is taken away though, with Alfred mentioning that your stockpile of weaponised glue was unstable and has disintegrated to conveniently explain why you come up with a weapon that does exactly the same thing in Arkham City. The main focus of ‘Cold, Cold Heart’ is on exploring the origin story of Mr. Freeze, including one of those crime scene recreation bits that will tell you nothing you didn’t already know if you saw the episode of the Batman cartoon that did the same thing. Freeze is a tragic villain, one who only wants to cure his cryogenically frozen wife, and so beating him up again isn’t very satisfying. 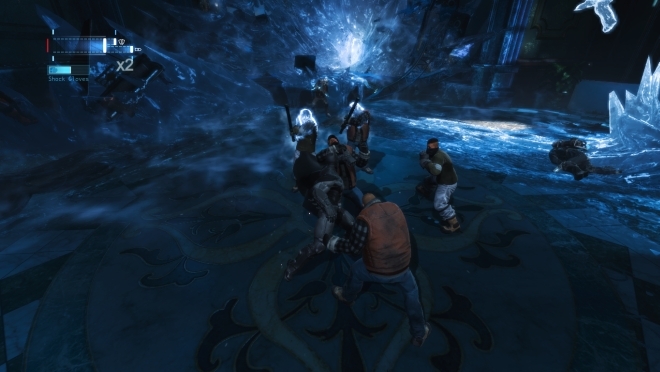 The climax is a repeat of the time you fought him in Arkham City only not as good, with an infinite supply of gun-toting mobsters interrupting your game of cat and mouse and stalactites on the ceiling that can be knocked down onto him with thermal Batarangs as a shortcut. This misunderstood version of Mr. Freeze, like Anarky, is a character better used in grudging team-ups than as another punching bag for Batman. If I’m going to be wailing on Mr. Freeze before dragging him to prison I’d rather it was the version who’d shout “You are not sending me to the cooler!” while I did it. Red Dead Redemption, And Some Other Stuff.